As part of its efforts to reduce environmental impact, McDonald's Japan began reducing its packaging for takeout items at about 3,700 outlets across Japan from December 1, 2008. 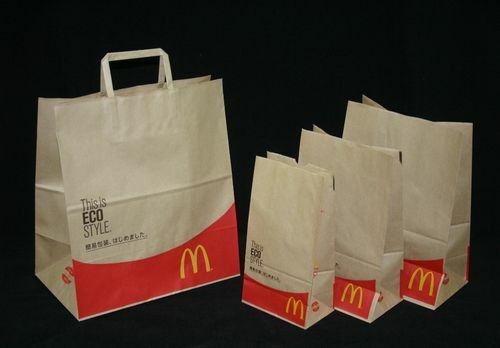 Instead of polyethylene shopping bags, McDonald's introduced unbleached paper bags, and taking this opportunity, it also replaced other bleached paper bags with more environmently friendly unbleached ones. The company expects such efforts to save about 2,300 tons of plastic resources annually, equivalent to approx. 6,200 tons of carbon dioxide (CO2) emissions, or to the annual CO2 absorption of approx. 248,700 Japanese cypress trees. The new packaging policy implemented at each outlet includes: no packaging for single drink items; and no large bags for items packed in two or fewer small bags. The catch-line "This is ECO STYLE" is printed on the newly introduced paper bags, delivering a message that McDonald's is working with its customers to promote environmental responsibility. The company is part of the Team Minus 6% program initiated by the government, and is conducting environmental activities to raise awareness among customers and employees through a national campaign aiming to reduce CO2 emmissions by 1 kg per day per person.